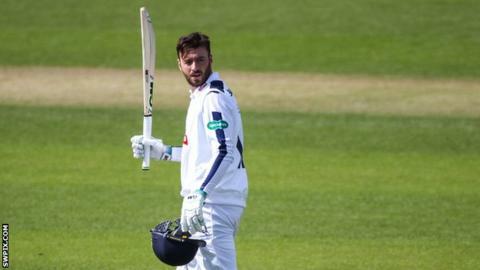 James Vince and Sean Ervine hit centuries as Hampshire fought back against Yorkshire at Headingley. Resuming on 76, England hopeful Vince was bowled for 119 by Steven Patterson. Wicketkeeper Adam Wheater (62) chipped Patterson to mid-wicket after a 143-run seventh-wicket stand with Ervine. The Zimbabwean's century followed, off 205 balls, before he was caught behind to become Ryan Sidebottom's 1,000th career wicket as Hampshire closed on 450-8, trailing by 143 runs. Vince's 18th first-class century from 173 balls, which included 15 fours, brought stability to the visitors' erratic first innings and halted the dominance of champions Yorkshire. With uncertainty surrounding England's top-order, Vince - who is yet to play in a Test match for England - followed Ian Bell and Sam Robson in using the start of the county season to showcase his abilities. As the hosts toiled in the sun on the third day, Ervine marked his 200th first-class match with a hard-fought ton to help Hampshire avoid the follow-on. Astute batting from South African bowler Ryan McLaren, who finished unbeaten on 55, and Chris Wood ensured the away side battled through the day for loss of just three wickets.